n eastern Sudan's Gadarif city there is a school with a special mission. It is educating the country's future midwives to play a role in eradicating Female Genital Mutilation or FGM. nside the compound are the classes where they learn and the dorms where they live. They follow a strict routine while they are here: they are only allowed to leave the premises in the case of an emergency and their families are only permitted to visit them at the weekends and during the holidays. The school was established in 1973. Each year, somewhere between 50 and 70 students graduate after spending 15 months studying here. Khaleel prides herself on the success of her graduates. n fact, if the school finds out that one of their midwives have performed FGM, they will have their license revoked. They will then have to return to the school and go through a period of retraining until the school's authorities are convinced that they will never again practice FGM. Every midwife here has her own bag full of the tools needed to perform a delivery. These include scissors, disinfectant and a set of scales with which to weigh the baby. Inside the director's office, one of the school's graduates, who now works as a full-time midwife, reveals the contents of her bag and demonstrates how she carries out the all-important ritual of sanitising all of her tools whenever she assists at a birth. 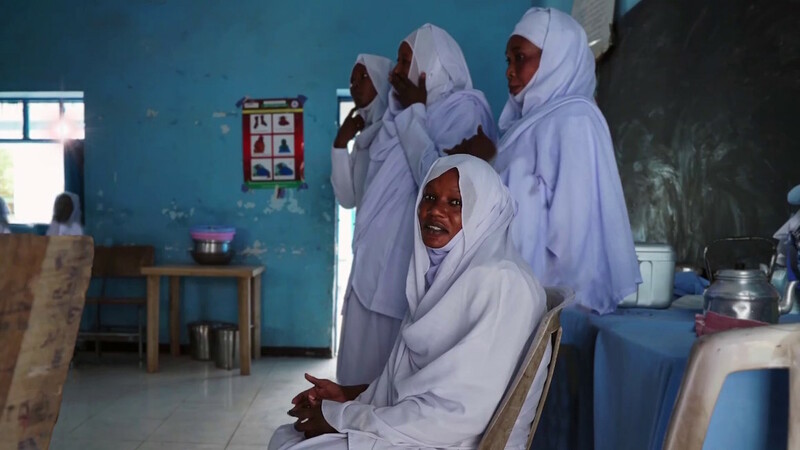 tanding proud in her white outfit, 29-year-old Madina Nasser Hroon Zakaria shares her story, explaining why she decided to become a midwife. "My mother died while giving birth to me," she says. "[It was] due to a doctor's negligence, which led to an infection that took her life." She fights back her tears as she explains how that personal tragedy inspired her career choice. She wanted to help other women so that their children wouldn't have to grow up with a mother, she says. "I decided to save women's and their baby's lives." I am also against FGM and I ensure that no midwife performs this barbaric custom," she continues. Her passionate opposition is inspired by her first-hand experience of FGM. "I went through it, so I am familiar with the physical and mental pain it inflicts on the little girls that endure it," Zakaria says. "I know too well the harm this cultural practice does to girls." Zakaria is a mother of two children, a girl and a boy. Together with her husband, she decided that her daughter will never have to endure that suffering. "I told my daughter if anyone tries to do anything to her she needs to tell us and the school, this is the only way we can stop it. We need to educate and empower our children," she says. he school has an agreement with local schools and the police where they report anyone that performs FGM. nd this is where local organisations like Zenab for Women in Development [ZWD] can come in. The women's rights organisation is named after Zenab Mohamad Nour, the first woman to be educated in Gadaref state back in the 1930s. From the 1940s to the 1980s, she established many girls' schools in the region. ZWD was founded by her daughter, Dr Fatima Ahmed, in 2000 with the aim of promoting peace-building, women's rights, women's reproductive health and girls' education. It is based in Gadaref and also has an office in the Sudanese capital, Khartoum. It supports the midwifery school as just one of many initiatives it believes empowers and supports local women. And it seems to be working. Since the school was opened in 1973, the number of incidents of FGM have dropped. Out of the 12 counties in Gadaref state, only one now officially allows FGM. ccording to Amira Azhari, the secretary of Customs and Social Practices at Sudan's National Council for Children, three surveys have been carried out on FGM in the country. In 2006, a Family Health Survey indicated that more than 43 percent of Sudanese girls aged 0-14 had undergone FGM. When another survey was conducted in 2010, that rate had fallen to 37 percent in the same age group. The Cluster Survey (a multi indicator survey) of 2014, whose results have just been released, indicate that in the same age group the percentage fell to 32.5 percent. According to Azhari, one of the indicators measures the intent to perform FGM on family members - and this has also shown a decline. But, for the midwives of Gadaref, this isn't good enough. They want to reduce that percentage to zero. "I love my job and I will not stop until we spread the knowledge," says Zakaria. "I strive to be better and help more children and women."